Having a garden or a dedicated green space has become something of a luxury. The spaces that we live in reflect the ways that our population has changed and grown, which means more people living in smaller areas. When you’re residing in a terraced house or in an apartment, a dedicated garden just isn’t an option. So it’s time to bring the outside in with a beautiful and unique window jungle. When you’re choosing the plants that you’ll place in your home consider your budget, where you’ll be placing the plants (how much light they’ll get), how much water they need and how much time you want to spend maintaining your plants. Ferns don’t love extreme temperatures or dry air. They will thrive in a little humidity. So while they’re not good candidates for the windowsill, consider placing a fern or two in places that tend to have a little more water in the air, like the bathroom. Cacti and succulents, like Aloe Vera, will generally be happy living around a window. There are a huge range of types to choose from, so you can enjoy putting together a varied selection that will look great, and be hardy. 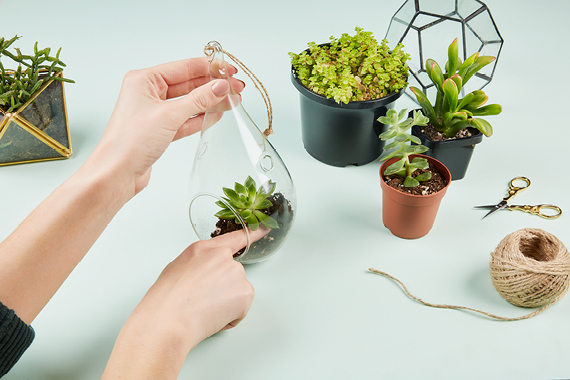 Perfect for novice plant owners! Hanging plants like Devil’s Ivy, Philodendron or Chain of Hearts look lovely, and can create a green ‘curtain’ effect as they grow. Be aware that some of these can be quite prolific growers given the right conditions, so may need maintenance to make sure they don’t dominate your space. We used (and love) glass hanging pots, but if you’re working to a budget, or just the upcycled look, you can opt for tin cans. Find a piece of driftwood, ideally through some relaxing beachcombing and wrap the ends it with sturdy rope. Use this rope to attach the wood to your window frame. 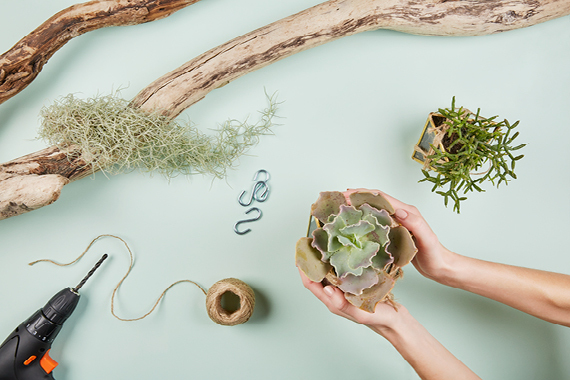 Use twine to suspend your terrarium pots from your length of driftwood. Make sure to vary the heights. Enjoy your new green space.